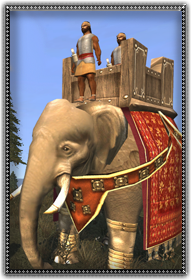 As if the mere sight of an elephant wasn’t fearsome enough, their presence now will churn the stomachs of all warriors. Heavy armour and a band of missile soldiers protect the beast while a manhout tamer guides the animal. The wealth of Indian rulers were measured by the number of elephants they owned, and the skill of their manhout elephant trainers. That is why, due to the sheer arrogance of kings, Indian elephants are most brutal in battle. These fearsome beasts are bound to wreak utter confusion and astonishment to foreign enemies who have never laid eyes upon such an animal. They terrorize the battlefield with a coordinated stampede or harass with their mounted archers. Bound to wreak utter confusion and astonishment to foreign enemies, has 3 mounted archers and can stampede charge.